But over 2000 years earlier, a man in Ancient Greece came up with nearly the exact same figure using just a stick and his brain. How an ancient Greek mathematician calculated the Earth's circumference. A Greek mathematician and the head of the library at Alexandria. Eratosthenes had heard that in Syene, a city south of Alexandria, no vertical shadows were cast at noon on the summer solstice. So, on June 21 he planted a stick directly in the ground and waited to see if a shadow would be cast at noon. It turns out there was one. And it measured about 7 degrees. 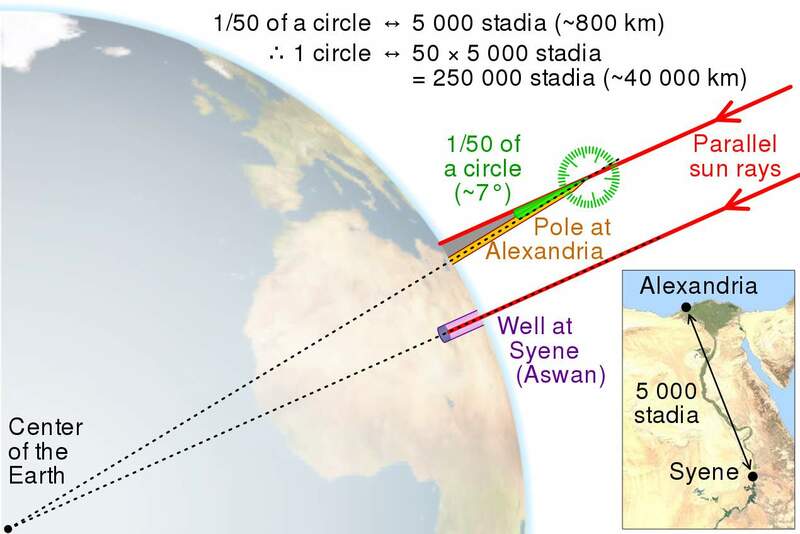 Now, if the sun's rays are coming in at the same angle at the same time of day, and a stick in Alexandria is casting a shadow while a stick in Syene is not, it must mean that the Earth's surface is curved. The idea of a spherical Earth was floated around by Pythagoras around 500 BC and validated by Aristotle a couple centuries later. 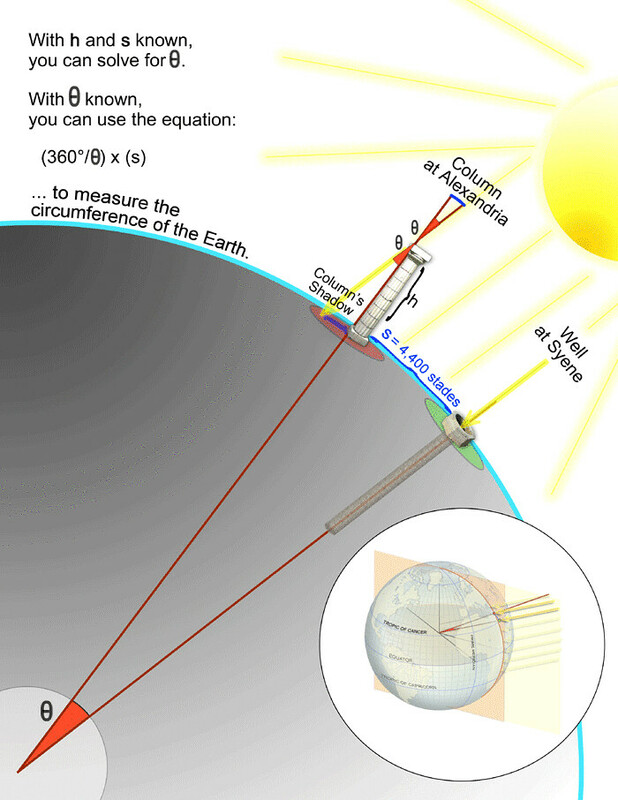 If the Earth really was a sphere, Eratosthenes could use his observations to estimate the circumference of the entire planet. 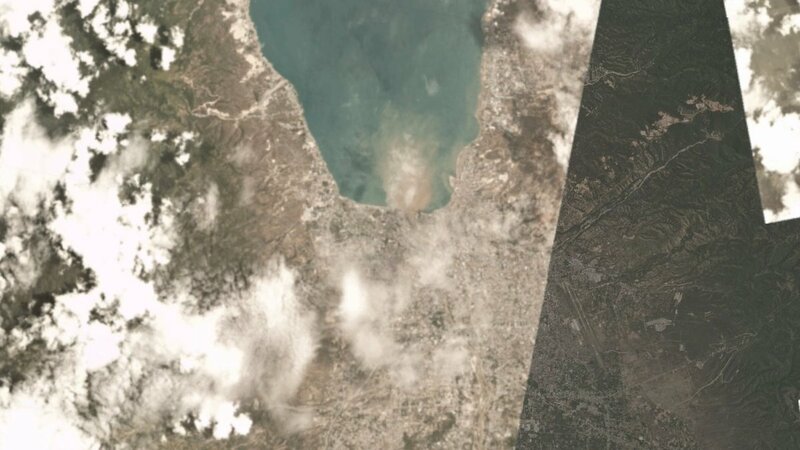 Since the difference in shadow length is 7 degrees in Alexandria and Syene, that means the two cities are 7 degrees apart on Earth's 360-degrees surface. Eratosthenes hired a man to pace the distance between the two cities and learned they were 5,000 stadia apart, which is about 800 kilometers. He could then use simple proportions to find the Earth's circumference — 7.2 degrees is 1/50 of 360 degrees, so 800 times 50 equals 40,000 kilometers. And just like that, a man 2200 years ago found the circumference of our entire planet with just a stick and his brain. Although the world's oceans make up nearly 75% of the planet's surface and provide 97% of the its habitable area, not even 4% of the ocean is protected by governmentally sanctioned marine protected areas (MPAs) *. While the United Nations Convention on Biological Diversity has set a global goal of protecting 10% of coastal areas by 2020, the United Kingdom's Environment Minister, Thérèse Coffey, recently called for 30% of the world's oceans to be protected by the year 2030. 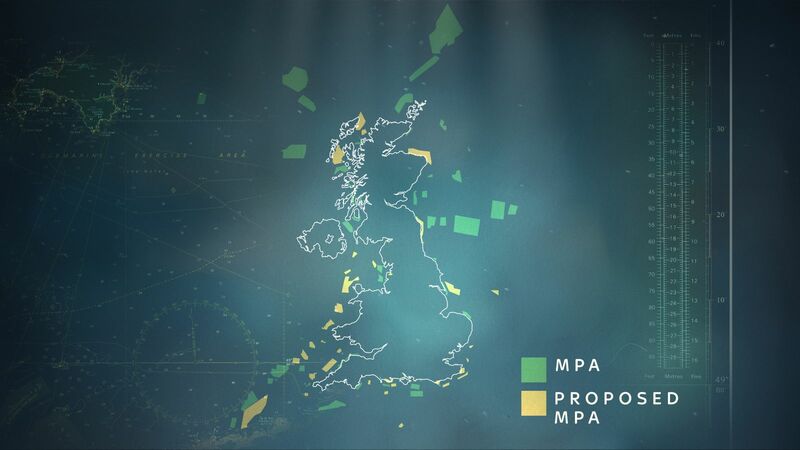 MPAs have been shown to maintain biodiversity by serving as a sanctuary for endangered species as well as immature sea life not yet eligible for commercial fishing. They can also preclude destructive human activities (such as bottom trawling), allowing ecosystems to recover. 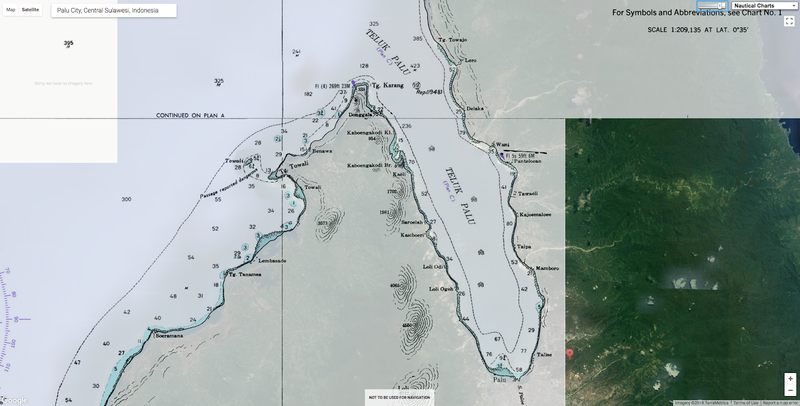 Many animals are able to safely grow and reproduce within MPAs that forbid human activities, which can increase the amount and size of fish caught in fishing areas adjacent to the MPA. 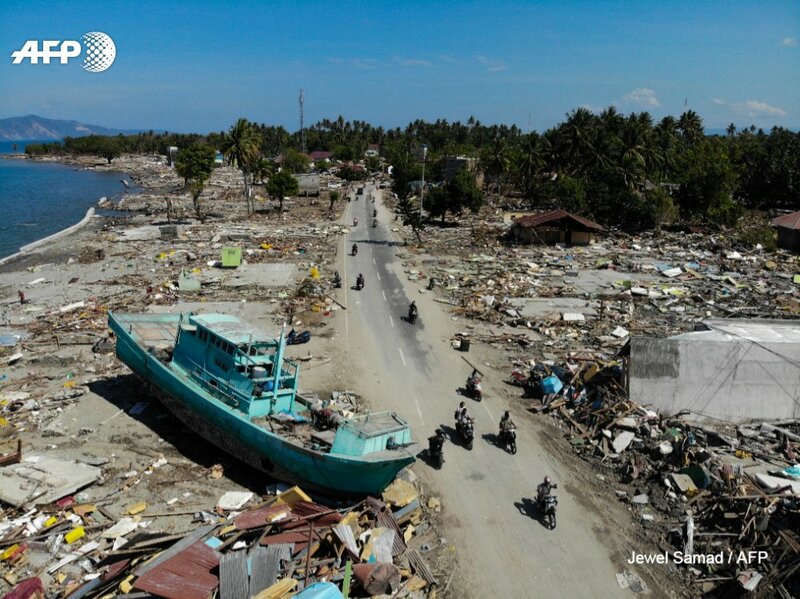 It has also been suggested that MPAs can enhance resilience to environmental change (like pollution and warming). Ultimately, these protections support local communities that rely on healthy fisheries and ecosystems for their cultural practices, economies, and livelihoods. Nearly 15% of the global population depends on seafood for protein, and according to professor of marine conservation, Dr.
Callum Roberts, "protecting more ocean boosts prospects for fisheries. If you stop fishing an area, the fish quickly become bigger and more abundant, producing many times more offspring. These eggs and young fish spill into fishing grounds and increase catches. This means that by fishing less, in time it is actually possible to catch more fish, at less expense from more prolific stocks." 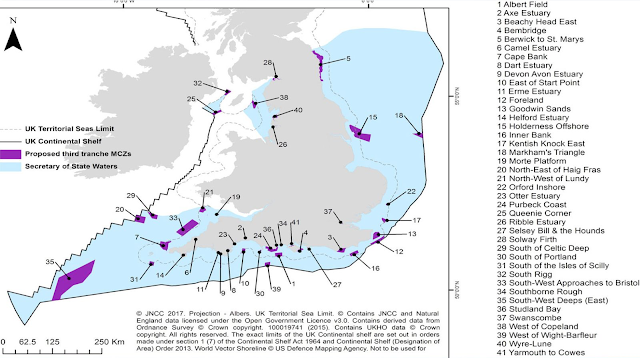 Under the plans, 41 new marine conservation zones around the UK's coastline will be created to safeguard marine habitats - from Devon in the South West to Berwick on the Scottish borders. Almost 12,000 square kilometres (7,457 square miles) of coastal waters are to be protected, with two sites in Northern Irish offshore waters. The new zones are in addition to 50 areas which have already been earmarked for conservation as part of the blue belt programme. One challenge associated with this ambitious endeavor is the management of high seas fisheries. Nearly 60% of the global oceans are considered the high seas, which are not under the jurisdiction of any one country. These large swathes of water are often subject to overfishing and deep sea mining. For example, the International Seabed Authority (ISA) has issued licenses to 29 contractors from 19 individual countries (including the United Kingdom) to survey these areas for mineral extraction and biotechnological purposes. Some of the more biodiverse sites include a range of seamounts found at the Clarion-Clipperton Fracture Zone and a field of hydrothermal vents in the Atlantic Ocean called the "Lost City". Currently, only 1% of the high seas is protected from industrial operations. The Northrop Grumman MQ-4C Triton is an unmanned aerial vehicle (UAV) under development for the United States Navy as a surveillance aircraft. In tandem with its associated ground control station, it is considered an unmanned aircraft system(UAS). Developed under the Broad Area Maritime Surveillance (BAMS) program, the system is intended to provide real-time intelligence, surveillance and reconnaissance missions (ISR) over vast ocean and coastal regions, continuous maritime surveillance, conduct search and rescue missions, and to complement the Boeing P-8 Poseidon maritime patrol aircraft. Nimble and quick, unmanned aerial vehicles have evolved into a valuable tool for marine and offshore applications. When a U.S. oil tanker conducts a Critical Area Inspection Plan (CAIP) as required by ABS, it is an onerous process. For example, each tank requires seven days of set up with scaffolding and staging. An ABS inspector and UDT technicians must access, and be carefully lowered into the tank with instrumentation and tools. Inspection points in far reaching places are surveyed. Carried out in the traditional fashion, it can be a difficult, dangerous, time consuming and expensive procedure. 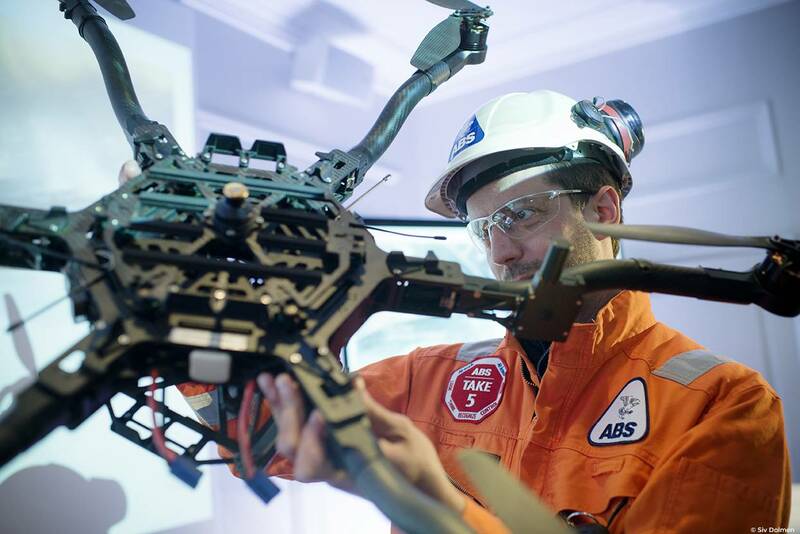 An ABS technician with a drone. Now, the same tanker is using drones to perform much of this function. A drone inspection can be conducted in about a day. Not all personnel have to be lowered into the tank. There’s no risk of items being dropped (and/or lost) in the tank, and the drone can easily go where it might be otherwise difficult and dangerous for humans to survey within the tank. Using a remote-controlled unmanned aerial vehicle (UAV) or drone, infrastructure inspections may be conducted easier, better and with less cost than traditional methods. 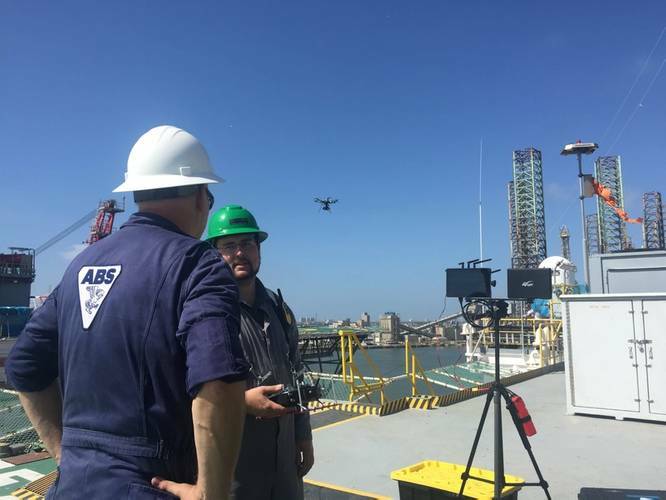 Early in arrival, but loaded with possibility, drones are changing the way inspections, surveys and work gets done on ships, vessels and offshore assets around the world. 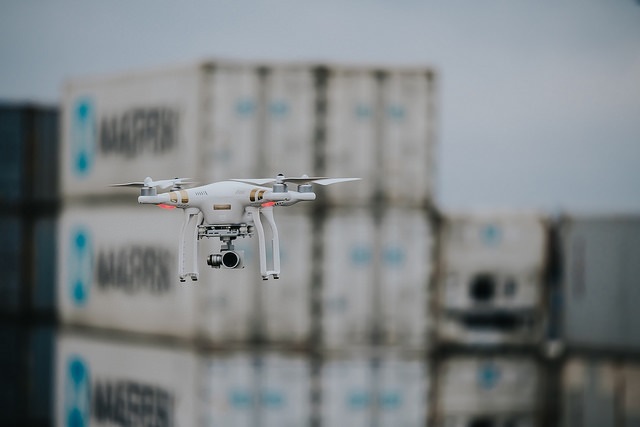 According to the Allianz Global Corporate & Specialty’s (AGCS) Safety and Shipping Review 2018, the uses for UAVs in the global maritime industry are many. Inspection and survey are obvious, but there are many other applications. They may survey environmental pollution such as questionable discharges in and around vessels, they may be used at terminals and on board ships to monitor cargo loading. They may also be used to safeguard against pirate activity in risky geographic areas. Their research indicated that drones could helped quick and urgent decision making by a ship’s crew when in a crisis management scenario. Having a drone can provide key information that would not otherwise be available. 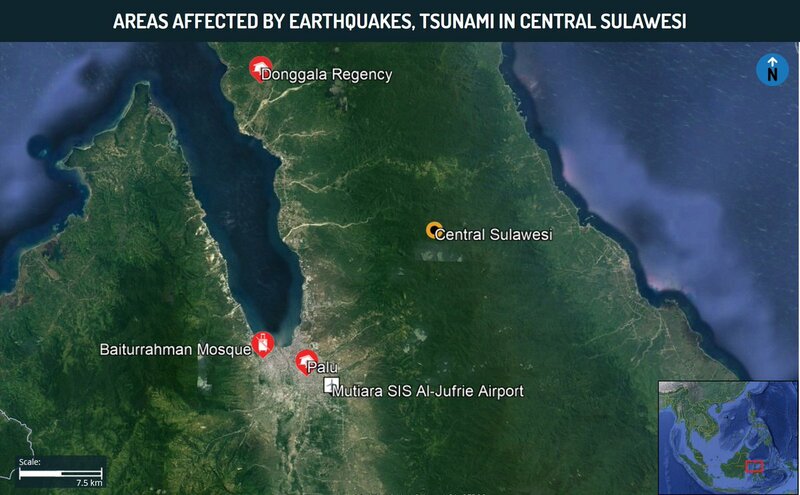 This would also include search and rescue (SAR) operations should the need arise. 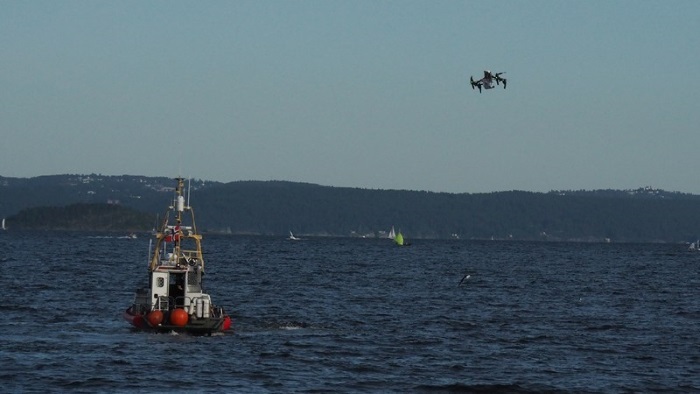 Drones may also be used for oceanographic research, gathering accurate information about bodies of water and shorelines used for navigational safety purposes. Such bathymetric surveys gather and aggregate such information for the publication of nautical charts. 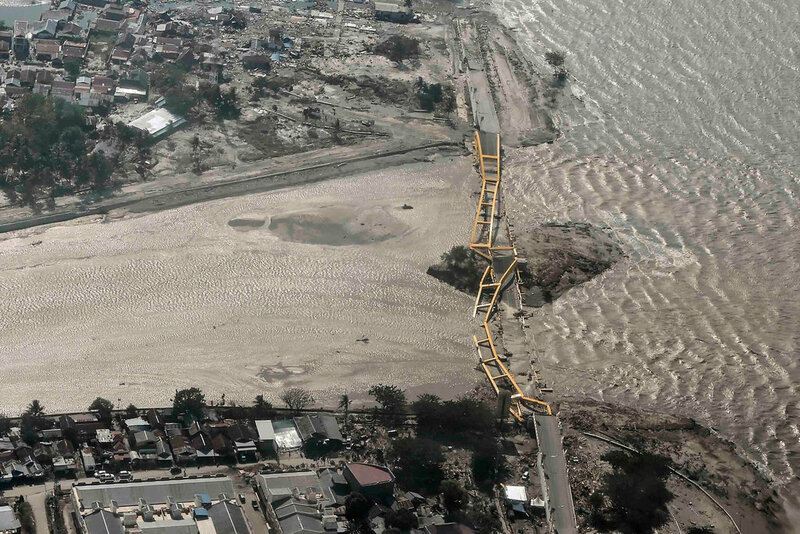 Drones may use specially designed bathymetric sensors and forego the use of aircraft and helicopters, saving significant cost. Their use is expected to be so prevalent in the future that regulatory guidance has been drafted to assist marine owners and operators. In 2016 ABS issued Guidance Notes on Using Unmanned Aerial Vehicles (UAVs). This comprehensive set of best practices, developed through extensive marine and offshore trials and testing, was introduced as industry considers the advantages of adopting aerial drone technology. This guidance outlines a certification framework for UAV inspection service providers. It also provides specific advice on the use of UAV for class surveys and non-class inspections. ABS as well as other classification societies clearly recognize their advantageous use during class surveys. ABS’ guidance notes the UAV value for data collection and data integration which can be further leveraged to ascertain the profile of a marine asset and enable more informed decisions. While drone use is coming of age in the maritime industry, the technology itself is also continuing to evolve. Lighter and more capable, providing value in multiple ways for maritime operators, regulators and other industry stakeholders, the new and better technology will continue to bring great dividends to decision makers in many different industrial areas. “Originally, drones were introduced as cheaper and safer alternatives for filmmakers needing aerial shots,” says Frank DeMartin, Yuneec, SVP of Sales & Marketing, Ontario, California. “However, in the last five years or so, technology surrounding drone sensors and cameras have taken off to make these valuable pieces of technology safer to operate and more effective. Improved camera gimbals have improved camera stability immensely, giving pilots more flexibility and availability to capture shots now that were unthinkable a few years ago. The payload, or weight the drone can carry in addition to its own weight, is able to incorporate more functionality and capabilities. “Advances in sensors and cameras are key as they are the enabler to more and better quality of data types,” says Efrat Fenigson, VP of Marketing for Airobotics in Petah Tikva, Israel. “We see payloads and sensors continuing to decrease in size and weight over time. Fenigson adds that technology for drone sensors and cameras is constantly evolving, and the fast pace of technological innovation continues to propel the industry forward, pushing the limits on what drones do. He says this drastically reduces the time and manpower required to collect such data, allowing industry professionals to focus on analyzing the data and generating actionable insights, rather than collecting data. If drones gather the data, personnel don’t have to. In a dangerous, industrial workplace, that translates into increased safety. Steve Conboy, Chairman and General of M-Fire Suppression in Carlsbad, CA works with drones used for wildfires suppression and firefighting. He says there are important parallels to the marine environment, one being an ability to forego human intervention in a potentially dangerous environment. “As with wildfires, marine sites are often difficult, or very dangerous, to reach,” says Conboy. “Aerial drones have the potential to play a major role in predictive maintenance, assessment and corrective maintenance systems and processes for marine and offshore assets,” says Don Gilbreath, VP Systems and a UAV pilot for the Rajant Corp.
“We can take a look at how they benefit structures like bridges, which are parallel to offshore platforms because they share the commonality of being a metal platform in water [and/or] salt water. Christian Tucci, President of Cinematic Aerospace – a Farmingdale, NY drone company specializing in aerial cinematography – says aerial drones are the perfect solution for the safe performance of preventative maintenance, especially for offshore equipment. “Even rigs and wind farms on land benefit from drones,” says Tucci. Offshore, the work is particularly dangerous for people. Inspectors have to go out in teams, dock against wind farms, climb up them, and inspect them. With a drone, a small team can take a boat out to the wind farm, launch the drone from the boat, fly the mission, see live feeds of the inspection from inside the boat’s cabin, and even stream these feeds back to engineers on land. If the drone is equipped with a stabilized zoom lens, which many now can be there is no reason for people to climb or be up close to wind farms and oil rig equipment. Efrat Fenigson says in addition to the preventive maintenance access and safety, they are very productive. His drones are used in the mining industry and have proven to be very efficient and productive. 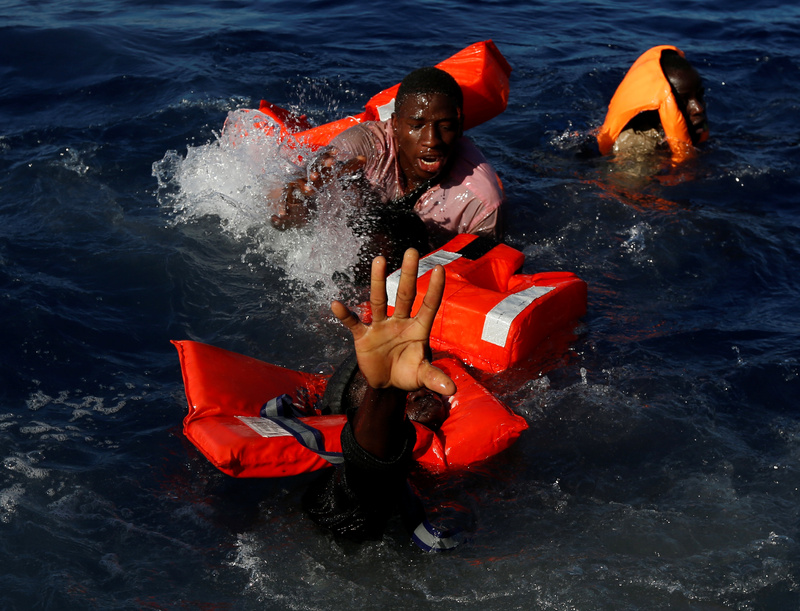 This same benefit can be expected in the maritime industry as well. “Fully autonomous platforms provide a new level of safety and productivity to offshore sites while allowing them to complete missions and acquire valuable data that would have taken much longer to collect manually or with other means, says Fenigson. “I am very hopeful about the future of drones across multiple sectors of the economy," says Steve Conboy. Drones offer a disruptive technology for offshore inspection and survey that forego human involvement. Marine applications for ships and ocean platforms are only one category of many structures that stand to benefit from their use. Others like wind power, communication towers, tanks and towers will benefit as well. The many uses for drones are still to be developed and even discovered. The use of drones, like that used in the inspection process in an oil tanker, will be more prevalent in the future. They are effective, less disruptive, and a less costly alternative to supplement human surveys. Their multiple uses are a key advantage. One drone can perform many different functions – inside a tank, but also outside of it. They can be carried on board, used by visiting inspectors, or used at the pier. “Geometric gains in processing power combined with nearly unimaginable data collection capabilities will happen swiftly,” says Tod Northman a Partner with the law firm of Tucker Ellis in Cleveland, Ohio. Indeed, for the maritime and offshore industry – today and tomorrow – drones are a very big deal. Marine Link : Aerial Drones Take Flight in Maritime / Drones: Is the Maritime Industry Ready? SpaceX, OneWeb, mPower, GEO vs. MEO vs. LEO, Ku vs. Ka band – if you’ve been, ‘in the market’ for any satellite connectivity service over the past few months you have, no doubt, run across at least a few of these terms, or players. It’s a tremendous, and tumultuous, period for the satellite sector right now, with new satellites bringing new capacity, new antenna form factors hoping to open up new markets, and business models changing the relationships between different parts of the value chain. With over $2.2 Billion in retail revenues over the next ten years, players across the value-chain are looking to see how they can get a (bigger) piece of this particular pie. As the maritime industry faces its own set of challenges – vessel oversupply , uncertain global economic trade, changing fuel prices, etc. – the satellite sector is facing an identity crisis. Changing media consumption habits on shore are causing a steady shift away from the cash-cow of video services, towards lower margin data services businesses. More satellite capacity is getting launched each year, betting on a ‘build it and they will come’ business model. Combined with the one-two punch of lower margin satellite capacity business and oversupply in the market, satellite operators are looking at how they can continue to sustain revenue growth. In just the next few years, by 2020, the amount of satellite capacity available in space will nearly double to almost 5.7 Tbps. By 2027, that figure is expected to be 37 Tbps. A lot of this capacity will come from Lower Earth Orbit (LEO), where Iridium currently operates, requiring significant changes to the onboard infrastructure. Antennas capable of quickly tracking and switching amongst upwards of thousands of satellites are still yet to be fully developed, much less at price-points that are appealing to end-users. Even more uncertain are the business models which will create sustainable revenue streams to support the operation of these new constellations. While not all of this capacity will be applicable or available to the maritime industry, these new satellite designs in both LEO and geo-stationary orbit (GEO) are changing how satellite networks are built and operated. This is redefining the role of the satellite operator and service provider, blurring the lines between the two in places. While each model has its advantages, the clear outcome of all this additional supply of satellite capacity is a better price per Mbps for customers. Now is a very good time to be a buyer of satellite capacity. Although consumer broadband, and other terrestrial markets will be the largest pieces of the pie for the satellite sector, maritime connectivity remains on everyone’s radar. However, the core challenge remains – some customers simply cannot or will not significantly increase the amount of bandwidth they need, which means new customers and applications must be found. Just how do all of these changes in space, on the ground and across the value-chain, impact the outlook for the maritime market? Using data from NSR’s Maritime SATCOM Markets, 6th Edition report, below are some of the key findings outlining what’s driving change in these markets. The largest market for maritime connectivity when measured by vessels and revenues, this remains the core opportunity for satellite connectivity providers. Although macro-economic challenges continue to pressure end-user budgets, clear benefits are emerging on the overall net-positives of higher levels of connectivity on the ship. With more than 32,000 ships expected to gain broadband connectivity over the next ten years, the market continues to show upward signs of growth. At over $1.2B in revenues in 2017, merchant maritime represents the largest market for satellite connectivity. 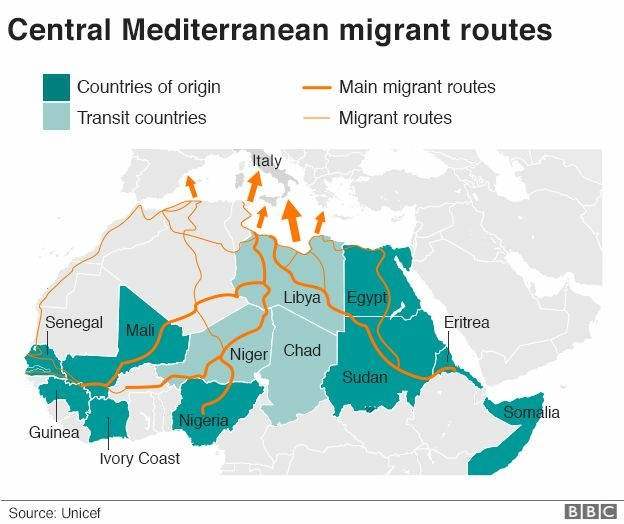 Yet, the future is not just connecting vessels. Increasingly, revenue streams beyond pure connectivity are being explored by service providers – everything from managed IT infrastructure on board to tailored crew welfare solutions. With raw connectivity services looking more and more alike, and more of the technical operations of these networks being absorbed by the satellite operator, these value-added services will become the differentiating factor. Already, service providers are investing in a range of offerings through a combination of organic development and acquisitions. Focused on a range of value-added applications, none come quite to the top of conversation like cyber security, especially in merchant maritime. Following in the footsteps of Maersk and most recently COSCO, managed security offerings are a focus of conversation points for service providers and end-users alike. What has yet to be determined, and what the market will decide as these offerings mature, is what security offerings are ‘bundled-in’, and which ones are part of a tailored security-centric value-added offering. Overall, the merchant sector is poised for strong growth. Driven by falling capacity prices, a migration from MSS to VSAT, and the digitalisation of shipboard operations service providers and satellite operators continue to focus in on connecting merchant maritime operations. On the back of the recent bandwidth battles of last year – 300 Mbps to an MSC ship in June 2017 to 3.2 Gbps to a Carnival ship by May 2018 commercial passenger satellite connectivity markets are all about the bits. Live screen shot of dials onboard the Carnival Horizon as the bandwidth reached 3.174 Gbps. With the core segment of ocean-going cruise ships already well penetrated, service providers are spending their efforts on increasing throughput rather than connecting the unconnected. As such, the battle of the Mbps between service providers and satellite operators, and between different orbits is shaping up to be at its hottest in this sector. With O3b’s MEO connectivity option a proven entity, the next wave of LEOs are aiming to significantly increase the throughput available to passengers on tomorrow’s cruise ships. Not to be standing still, ‘traditional’ GEO options using newer satellites with higher throughput are setting benchmarks. The 3.2 Gbps benchmark to a Carnival ship was set using a GEO satellite. All told, commercial passenger markets will demand 590 Gbps of satellite connectivity by 2027, or almost 8 out of every 10 Gbps of demand in the maritime satcom sector. Take a look at any family on holiday, and ‘disconnected’ isn’t part of the equation. From posting to social media, to video streaming, to checking e-mails, multiple devices per family is a fact of life. Layer that on top of the typical number of guests per ship, and you have demand levels that are stretching the capabilities of satellite connectivity. The upside of all of this demand? Capacity prices continue to fall, enabling cruise operators to take advantage of the bandwidth explosion. While still spending more and more each year on connectivity, the levels of connectivity per ship are increasing exponentially. 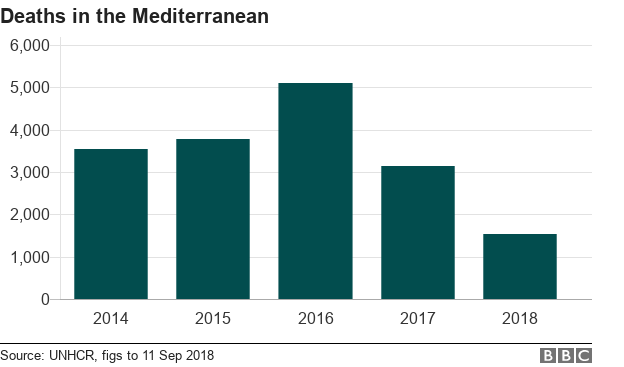 More than just Offshore Support Vessels, the offshore sector has taken perhaps the largest hit over the last few years. Driven by the huge increases in onshore oil & gas activities, the offshore segment is in a period of reorganization and recovery. With only 1.2 per cent revenue growth projected over the next ten years, the segment will still be a significant percentage of revenue yet will not be a source of significant growth for service providers. More so than other maritime segments, the benefits of improving the collection, processing, and action of data-centric operations are clear. Oil & Gas end-users have invested, or will invest significant amounts of money improving the data collection abilities of their remote assets, adding sensors throughout the lifecycle of O&G operations, which must in turn be converted into actionable insights. That movement of data will be driving 17 Gbps of demand for satellite connectivity by 2027. With that increase in demand, O&G players are looking to increase their operational efficiencies to allow more offshore resources to compete at the lower crude oil prices expected over the next ten years. However, demand from increasing data gathering across these operations is only going to go so far. Cost pressures continue to be felt across the value-chain, reaching into the satellite service provider layer. Cheaper capacity will help balance the internal margins of service providers, but just as with other areas of the maritime satcom markets, looking for other sources of revenues will be key to maintaining growth. Cyber security, crew welfare, managing M2M data, and systems integration are only a few of the emerging value-added services from service providers. Alongside their traditional role of creating highly redundant, robust connectivity networks for this sector where a few minutes of connectivity downtime can result in significant amounts of lost revenue for end-users, the value-added services are increasingly what will distinguish service providers. 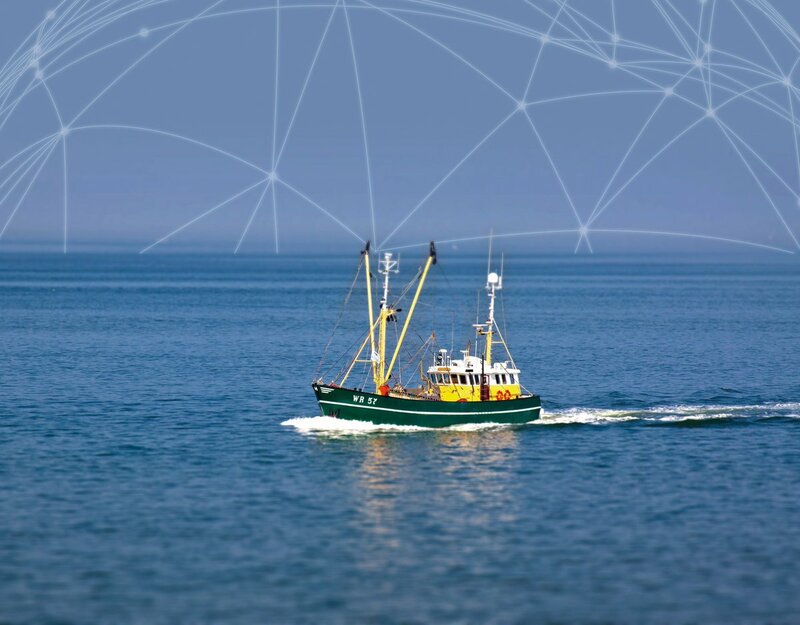 With a large addressable market, the satellite communications sector has yet to truly create a winning combination of price/connectivity to crack open the fishing market. 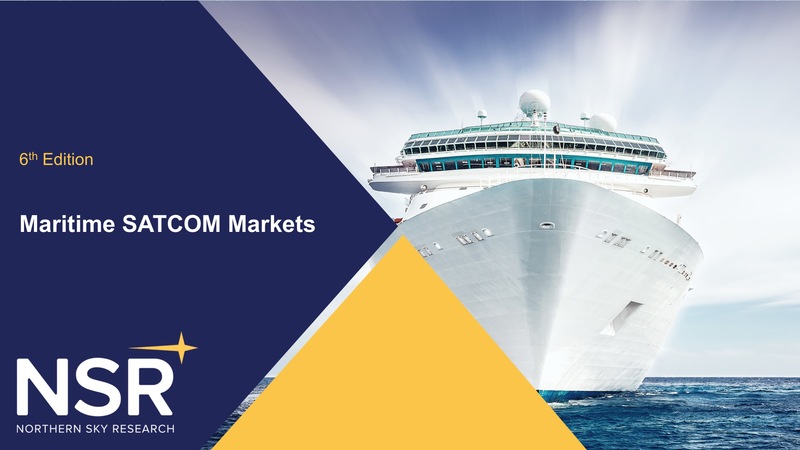 As the current market is largely focused on either the very high-end commercial vessels, or the lowest end vessels subject to regulatory reporting and monitoring requirements, the satcom sector has not developed a successful migration path. With some 6,500 new broadband vessels expected over the next ten years, and an impressive 97 per cent of vessels not adopting broadband connectivity, there is a clear market opportunity. Flat panel antennas and lower cost of capacity are key ingredients along that path, and developing a compelling set of services and applications to meet the need of the fishing industry will be an area that service providers must invest in. However, narrowband connectivity will remain the largest driver of satellite connectivity revenues in the fishing sector. As the world continues to focus on sustainable fishing practices, catch monitoring, vessel positions, and other regulatory requirements will continue to expand the lower end of the market for satellite communications, with the hope that these vessels, once connected, can be up-sold to higher levels of connectivity. Overall, until the cost of equipment for broadband connectivity falls significantly, the majority of the fishing market will remain out of reach for service providers looking to enable broadband connectivity. Tied directly to disposable income and other macro-economic factors, the outlook for the leisure satcom sector is improving. With only 12 per cent of vessels adopting broadband connectivity by 2027, generating $275M revenues, it will remain a niche segment of the overall market – but at a time where highly diversified service providers are winning out it is one of the latest markets to see consolidation. With a demanding customer base, highly seasonal demand patterns, and the ever-increasing requirements for connectivity in the market, service providers need access to a large amount of capacity in a few specific regions at a few specific times. Combine that with a complex onboard network that is customised per vessel and you have a mix of requirements that necessitates a significantly high amount of customer-service focus to be successful in the market. More than just building the satellite side of the connectivity puzzle, new flat panel antennas are looking to target this segment first. Hoping to appeal to the design requirements of the leisure yachting sector, look to this market to be the first adopters of antennas from the likes of Kymeta or Phasor. Overall, at $114M in cumulative equipment revenues over the next ten years, there remains a sizeable opportunity for new technologies to enter and be adopted in the market. Now is a transformational period in maritime satcom connectivity, as more capacity comes online, business models continue to evolve, and digitization across the entire maritime industry accelerates. More capacity and new antennas will drive new growth opportunities and open new revenue streams for the satellite communications sector in terms of customers and applications.